Earth is a water planet. Oceans of liquid water dominate the surface processes of the planet. On the surface, water controls weathering as well as transport and deposition of sediments. Liquid water is necessary for life. In the interior, water fluxes melting and controls the solid-state viscosity of the convecting mantle and so controls volcanism and tectonics. Oceans cover more than 70% of the surface but make up only about 0.025% of the planet's mass. Hydrogen is the most abundant element in the cosmos, but in the bulk Earth, it is one of the most poorly constrained chemical compositional variables. Almost all of the nominally anhydrous minerals that compose the Earth's crust and mantle can incorporate measurable amounts of hydrogen. Because these are minerals that contain oxygen as the principal anion, the major incorporation mechanism is as hydroxyl, OH-, and the chemical component is equivalent to water, H2O. Although the hydrogen proton can be considered a monovalent cation, it does not occupy same structural position as a typical cation in a mineral structure, but rather forms a hydrogen bond with the oxygens on the edge of the coordination polyhedron. The amount incorporated is thus quite sensitive to pressure and the amount of H that can be incorporated in these phases generally increases with pressure and sometimes with temperature. Hydrogen solubility in nominally anhydrous minerals is thus much more sensitive to temperature and pressure than that of other elements. Because the mass of rock in the mantle is so large relative to ocean mass, the amount that is incorporated the nominally anhydrous phases of the interior may constitute the largest reservoir of water in the planet. Understanding the behavior and chemistry of hydrogen in minerals at the atomic scale is thus central to understanding the geology of the planet. There have been significant recent advances in the detection, measurement, and location of H in the nominally anhydrous silicate and oxide minerals that compose the planet. There have also been advances in experimental methods for measurement of H diffusion and the effects of H on the phase boundaries and physical properties whereby the presence of H in the interior may be inferred from seismic or other geophysical studies. 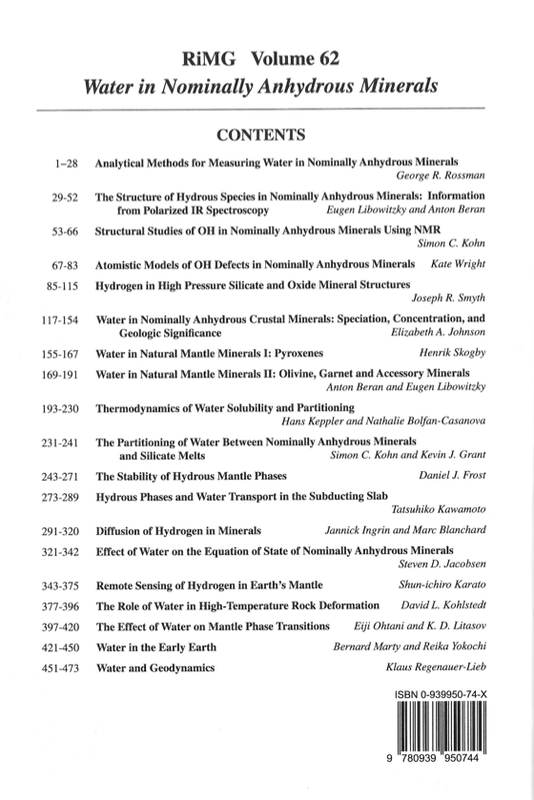 It is the objective of this volume to consolidate these advances with reviews of recent research in the geochemistry and mineral physics of hydrogen in the principal mineral phases of the Earth's crust and mantle. 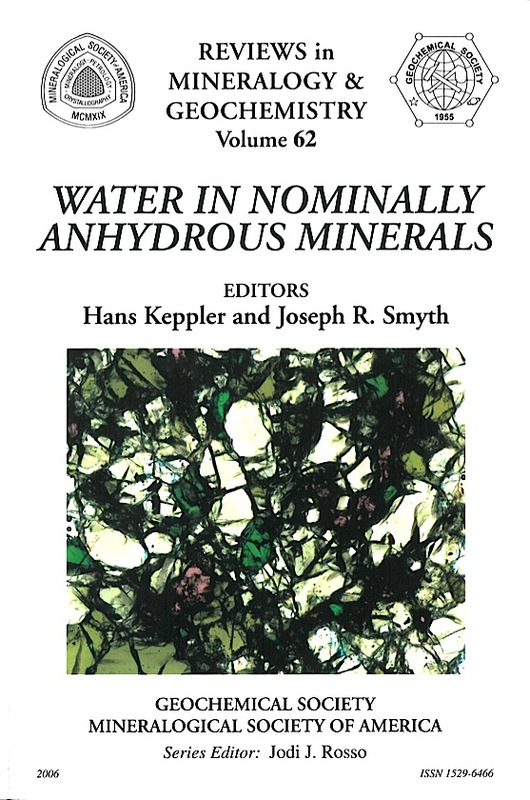 We begin with a review of analytical methods for measuring and calibrating water contents in nominally anhydrous minerals by George Rossman. While infrared spectroscopy is still the most sensitive and most convenient method for detecting water in minerals, it is not intrinsically quantitative but requires calibration by some other, independent analytical method, such as nuclear reaction analysis, hydrogen manometry, or SIMS. A particular advantage of infrared spectroscopy, however, is the fact that it does not only probe the concentration, but also the structure of hydrous species in a mineral and in many cases the precise location of a proton in a mineral structure can be worked out based on infrared spectra alone. The methods and principles behind this are reviewed by Eugen Libowitzky and Anton Beran, with many illustrative examples. Compared to infrared spectroscopy, NMR is much less used in studying hydrogen in minerals, mostly due to its lower sensitivity, the requirement of samples free of paramagnetic ions such as Fe2+ and because of the more complicated instrumentation required for NMR measurements. However, NMR could be very useful under some circumstances. It could detect any hydrogen species in a sample, including such species as H2 that would be invisible with infrared. Potential applications of NMR to the study of hydrogen in minerals are reviewed by Simon Kohn. While structural models of "water" in minerals have already been deduced from infrared spectra several decades ago, in recent years atomistic modeling has become a powerful tool for predicting potential sites for hydrogen in minerals. The review by Kate Wright gives an overview over both quantum mechanical methods and classical methods based on interatomic potentials. Joseph Smyth then summarizes the crystal chemistry of hydrogen in high-pressure silicate and oxide minerals. As a general rule, the incorporation of hydrogen is not controlled by the size of potential sites in the crystal lattice; rather, the protons will preferentially attach to oxygen atoms that are electrostatically underbonded, such as the non-silicate oxygen atoms in some high-pressure phases. Moreover, heterovalent substitutions, e.g., the substitution of Al3+ for Si4+, can have a major effect on the incorporation of hydrogen. Data on water in natural minerals from crust and mantle are compiled and discussed in three reviews by Elisabeth Johnson, Henrik Skogby and by Anton Beran and Eugen Libowitzky. Among the major mantle minerals, clinopyroxenes usually retain the highest water contents, followed by orthopyroxenes and olivine, while the water contents in garnets are generally low. Most of these water contents need to be considered as minimum values, as many of the mantle xenoliths may have lost water during ascent. However, there are some cases where the correlation between the water contents and other geochemical parameters suggest that the measured water concentrations reflect the true original water content in the mantle. The basic thermodynamics as well as experimental data on water solubility and partitioning are reviewed by Hans Keppler and Nathalie Bolfan Casanova. Water solubility in minerals depends in a complicated way on pressure, temperature, water fugacity and bulk composition. For example, water solubility in the same mineral can increase or decrease with temperature, depending on the pressure of the experiments. Nevertheless, the pressure and temperature dependence of water solubility can be described by a rather simple thermodynamic formalism and for most minerals of the upper mantle, the relevant thermodynamic parameters are known. The highest water solubilities are reached in the minerals wadsleyite and ringwoodite stable in the transition zone, while the minerals of the lower mantle are probably mostly dry. The rather limited experimental data on water partitioning between silicate melts and minerals are reviewed by Simon Kohn and Kevin Grant. One important observation here is that comparing the compatibility of hydrogen with that of some rare earth element is misleading, as such correlations are always limited to a small range of pressure and temperature for a given mineral. The stabilities of hydrous phases in the peridotite mantle and in subducted slabs are reviewed by Daniel Frost and by Tatsuhiko Kawamoto. While most of the water in the mantle is certainly stored in the nominally anhydrous minerals, hydrous phases can be important storage sites of water in certain environments. Amphibole and phlogopite require a significant metasomatic enrichment of Na and K in order to be stabilized in the upper mantle, but serpentine may be an important carrier of water in cold subducted slabs. The diffusion of hydrogen in minerals is reviewed by Jannick Ingrin and Marc Blanchard. An important general observation here is that natural minerals usually do not loose hydrogen as water, but as H2 generated by redox reaction of OH with Fe2+. Moreover, diffusion coefficients of different mantle minerals can vary by orders of magnitude, often with significant anisotropy. While some minerals in a mantle xenolith may therefore have lost virtually all of their water during ascent, other minerals may still preserve the original water content and in general, the apparent partition coefficients of water between the minerals of the same xenolith can be totally out of equilibrium. Accordingly, it would be highly desirable to directly deduce the water content in the mantle from geophysical data. One strategy, based on seismic velocities and therefore ultimately on the effect of water on the equation of state of minerals, is outlined by Steve Jacobsen. The dissolution of water in minerals usually increases the number of cation vacancies, yielding reduced bulk and shear moduli and seismic velocities. Particularly, the effect on shear velocities is strong and probably larger than the effect expected from local temperature variations. Accordingly, the vs/vp ratio could be a sensitive indicator of mantle hydration. 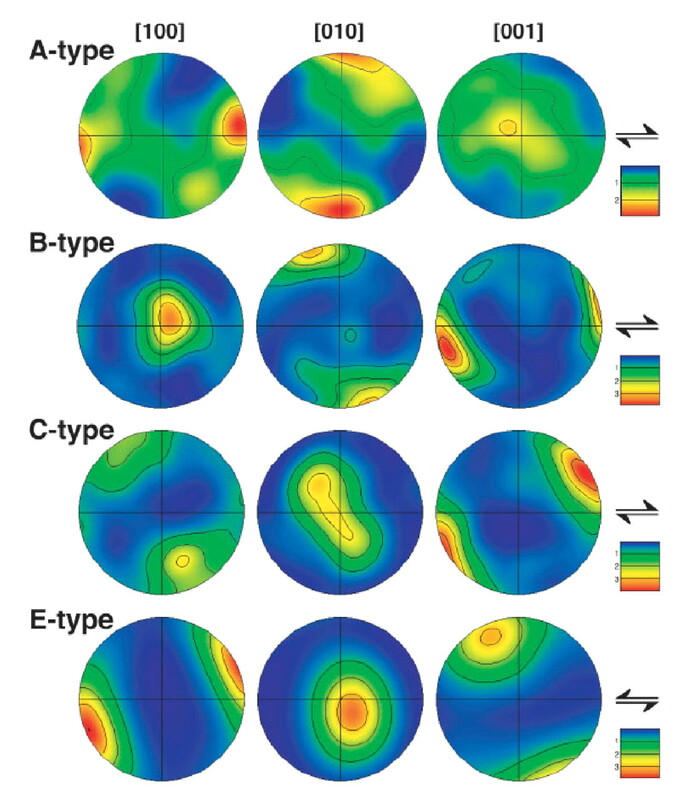 A more general approach towards remote sensing of hydrogen in the Earth's mantle, including effects of seismic anisotropy due to lattice preferred orientation and the use of electrical conductivity data is presented by Shun-ichiro Karato. Probably the most important effect of water on geodynamics is related to the fact that even traces of water dramatically reduce the mechanical strength of rocks during deformation. The physics behind this effect is discussed by David Kohlstedt. Interestingly, it appears that the main mechanism behind "hydrolytic weakening" is related to the effect of water on the concentration and mobility of Si vacancies, rather than to the protons themselves. 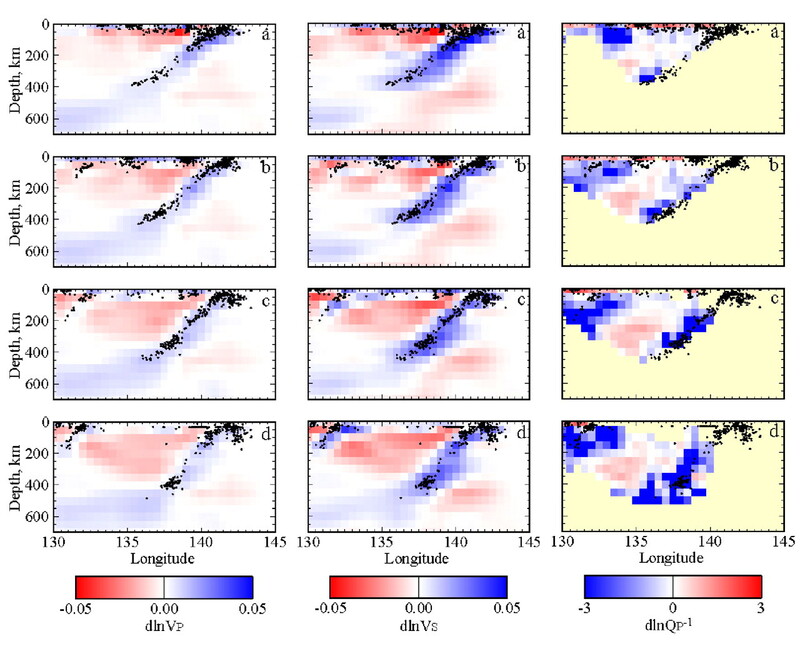 Water may have major effects on the location of mantle discontinuities, as reviewed by Eiji Ohtani and Konstantin Litasov. Most of these effects can be rationalized as being due to the expansion of the stability fields of those phases (e.g., wadsleyite) that preferentially incorporate water. Together with other geophysical data, the changes in the depths of discontinuities are a promising tool for the remote sensing of water contents in the mantle. The global effects of water on the evolution of our planet are reviewed in the last two chapters by Bernard Marty, Reika Yokochi and Klaus Regenauer-Lieb. By combining hydrogen und nitrogen isotope data, Marty and Yokochi demonstrate convincingly that most of the Earth's water very likely originated from a chondritic source. Water may have had a profound effect on the early evolution of our planet, since a water-rich dense atmosphere could have favored melting by a thermal blanketing effect. However, Marty and Yokochi also show very clearly that it is pretty much impossible to derive reliable estimates of the Earth's present-day water content from cosmochemical arguments, since many factors affecting the loss of water during and after accretion are poorly constrained or not constrained at all. In the last chapter, Klaus Regenauer-Lieb investigates the effect of water on the style of global tectonics. He demonstrates that plate tectonics as we know it is only possible if the water content of the mantle is above a threshold value. The different tectonic style observed on Mars and Venus may therefore be directly related to differences in mantle water content. Earth is the water planet — not just because of it's oceans, but also because of its tectonic evolution. Additional Volume Content, Color Plates 1 - 4.